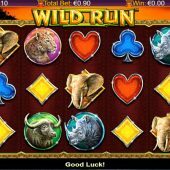 The dusty plains of the wilderness have been a theme of many a slot over the years, examples being 50 Lions from Aristocrat, Safari Heat by Playtech and Ash Gaming's Wild Gambler. 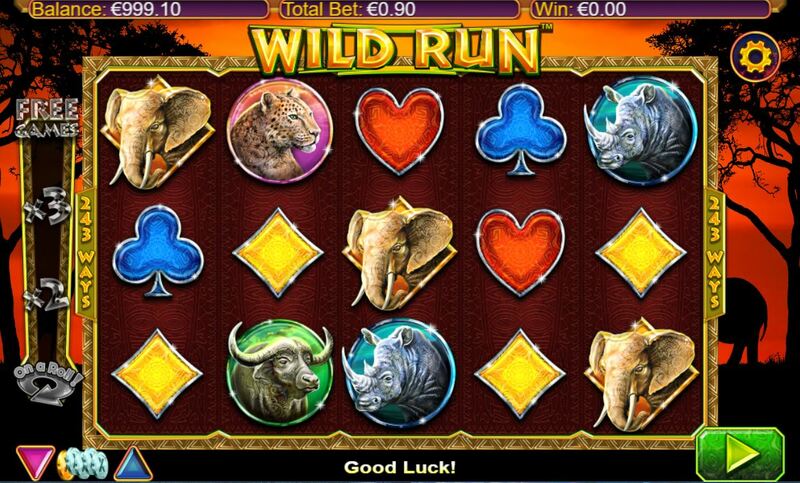 So up steps Wild Run slot from NextGen Gaming, which has exciting name and an African wildlife theme. However, alarm bells start ringing quite quickly as some of the artwork appears to have come straight from their very own Cash Stampede but with a slight rework of the colours. The game has sort of tribal music sound track running along in the background, suiting the theme. On the 5 reels and 3 rows there are the obligatory card icons, the lowest of which pays 1x bet for a 5-of-a-kind. Now at this juncture, seeing that low pay you might be expecting me to mention stacked symbols - alas no. The mighty Elephant is the top pay at 3.33x stake for 5, and the Rhino 2.67x with the last of the four animals sharing the prize of 1.67x stake, those being the Buffalo and Leopard. The game costs 30 coins for a play, which explains these odd values. Now ironically you may be wondering about the Wilds, given the title and I think one animal is notable by its absence - the mighty Lion. This of course makes the Wild symbol and here's the irony: no Wilds appear on the reels until you have a second consecutive win! This leads us to Wild Run's feature. On the left of the reels is the 'On A Roll' meter. Once you have one win this lights up at the bottom, and now for the second spin you have a Wild added to reels 1 and 5 which multiplies wins by 2. Should you get a third win, the meter rises one position and then your reels have a Wild Lion on reels 1, 2, 4, and 5 and they multiply and wins by 3. If this produces a win you get a minimum of 4 free games in which Wilds appear on all the reels, plus an extra one on each reel and they multiply any wins they appear in by 5. The Wilds have a pay of 800 coins for 5, or 26.67x stake. Now as you cannot get 5 in anything other than the free spins, does this mean this 800 is multiplied by 5x or does it include the 5x multiplier? I certainly couldn't tell! Once you've had 4 losing free spins the round ends, so you cannot get less than 4.